A comprehensive product portfolio for digital and traditional surfacing processes. Industry proven products for One-Step and Two-Step methods with a wide array of products designed to work with your technology platforms. We offer the very latest and most technologically advanced tapes, abrasives, velveteens, polish slurries and chemicals. The latest generation of digital polishing tools and digital slurries meet the most demanding requirements in today’s modern laboratory. 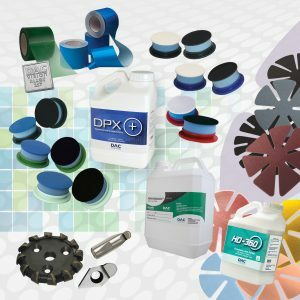 We have an extensive range of protective tapes, blocking alloy, blocking wax, generator blocks and more – everything you need for appropriate protection and adhesion to coated or uncoated lenses throughout the surfacing process. Regardless of your blocking preference, we have a tape solution for your specific process. All tapes are engineered to accommodate alloy or wax blocking mediums. Our high-quality soft tools provide superior formability, resulting in excellent performance throughout the complete curve range. We offer a complete line of fining or smoothing pads for every lens material – including CR-39™, mid-index, hi-index, polycarbonate, Trivex™ and glass/mineral lenses. Within each lens category we offer numerous combinations of abrasive and backing options to solve every fining challenge. Whether you prefer a 1-step or 2-step fining process, bare lap or base pad system, we have an abrasive pad system that will work for your process. For unmatched surface quality, let us recommend a fining pad system for your lab today. We offer a complete line of innovative polishing pads for every lens material – including all resin and mineral lenses. With a wide variety of flocking and backing options – DAC Technologies can solve every polishing challenge you encounter. For first rate polishing results, let us recommend a polish pad system for your lab today. We have a wide range of advanced polish chemistries specifically engineered for today’s equipment and standards. Our slurries are designed for use on all lens materials – whether you process resin or mineral lenses. For unmatched clarity and brilliance, let us recommend a polish solution for your lab today. Every lens processing laboratory requires unique chemicals to operate equipment efficiently. At DAC Technologies we understand this need and offer our customers a broad inventory of ophthalmic specific products. We carry a full range of surfacing additives, anti-foaming agents, coolants, neutralizers, slab kits and more. We carry a complete line of miscellaneous tools and accessories that keep your lab operating efficiently. We offer a complete line of aluminum or plastic lapping tools, job trays, calipers, measuring devices, cleaners, gloves, cleaning wipes, Baumé gauges and more. We offer the very latest consumables for the Anti-Reflective process and all the products you need for conventional tinting departments. We have a full range of tints in every color imaginable and for all lens materials. We offer high-quality brands that meet your specific needs and budget. In addition, we have UV treatments, neutralizers, cleaning solutions, scratch resistant treatments and more. DAC Technologies offers a variety of generic high purity chemicals for building an assortment of anti-reflective coating layers onto resin or mineral lenses. All chemicals can be sized and shaped to meet your specific equipment needs. DAC Technologies’ hydrophobic and super-hydrophobic top coatings can be customized to fit any specific requirements for layer thickness or vacuum chamber size – making anti-reflective coated lenses easier to clean. These products are available in ceramic or metallic containers. 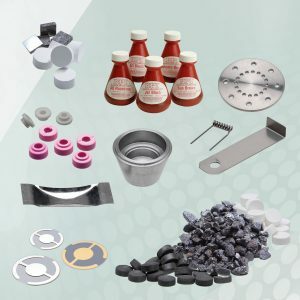 To complement our coating material product line, we offer an assortment of spare parts and consumables for vacuum deposition equipment. This includes ion and electron beam parts; crystals for monitoring coating thickness; boats and liners; lubricants for vacuum pumps and more. 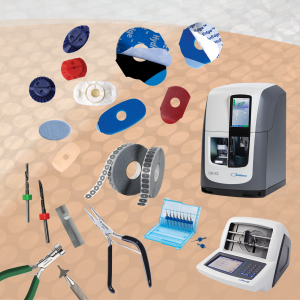 A complete offering of solutions to meet every challenging edging application designed and engineered for today’s lens materials and coatings. A wide variety of pad materials with multiple shapes, each with unique adhesive and foam chemistries. Edging blocks and dispensing tools are also part of our wide range of finishing products. DAC Technologies is well known for award winning edging pad products such as BluEdge™, SecurEdge®, RedEdge™, HydroEdge™ and many more. AutoMate™ is the new robotic edging pad for high-production automated equipment. All edging pad products are offered in a wide range of shapes and sizes to meet every edging challenge – including hydrophobic, super-hydrophobic, oleo-phobic and robotic applications. Regardless of your edger brand or technology, we have a pad to meet your particular requirements. We offer a complete range of plastic, flexible and metal edging blocks for almost every edging machine in use today. These blocks come in both standard and half-eye variations with choices of low to high base curves. Our award-winning edging pads are specifically designed to work in conjunction with the blocks we sell. Every finishing lab has an assortment of tools and accessories that streamline the finishing process. At DAC Technologies we have all your favorites, such as pattern blanks, honing sticks, drill bits, lens marking inks, measuring devices, pliers and more.